Rare 3+3 end unit in Van Nuys. Enter through your private patio and then open your front door to the spacious living room with a grand fireplace, wood floors, crown molding and balcony adorned with a beautiful maple tree just outside. Kitchen has been upgraded with granite counters, lots of cabinets, new stainless stove and staircase down to your 2 parking spaces in the gated subterranean garage. The laminate wood stairs lead you to your generous master also with wood laminate flooring, balcony and mirrored closet doors. The master bath features, granite counter and glass enclosed shower with bench. The 2 additional bedrooms both with wood laminate floors share the jack and jill bath also with granite and glass tub/shower enclosure. 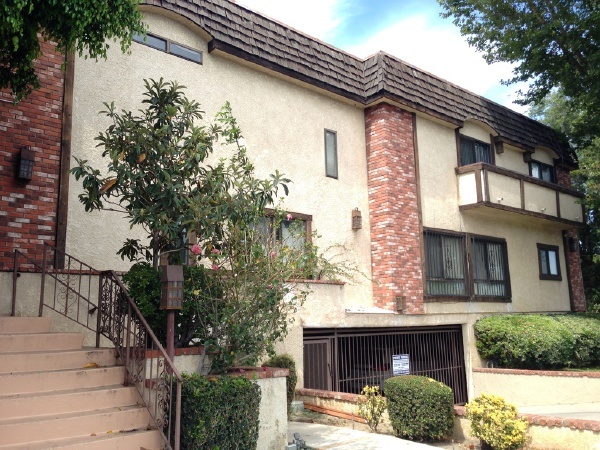 This front facing 2 story unit is light and bright with fresh paint and move-in condition. Conveniently located between the 170 and 405 fwys and close to shopping.